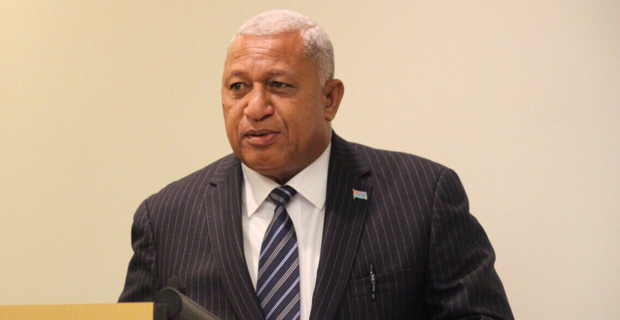 Prime Minister Voreqe Bainimarama says while it may be Fiji that will serve as COP23 President, he wants to assure his fellow Pacific leaders and residents that this is every pacific nations presidency because we are all vulnerable, with some of our neighbours facing threats to their very existence. Bainimarama stressed this at the 1st High Level Pacific Blue Economy Conference at the Grand Pacific Hotel this morning. Bainimarama says Fiji’s presidency is very much tied to promoting blue economic developments as the ocean, marine eco systems and the changing climate are linked to one another. He says the warming atmosphere is also raising the temperatures of the oceans and worsening ocean acidification. The Prime Minister says Fiji’s identity as a Pacific Island is tied to the health of the oceans, the marine plant and animal life that inhabit them. He says Fijians are oceanic people, with cultures, histories and ways of life rooted in the ocean environment. The two day conference is organised by the Pacific Islands Development Forum and the overall goal is to provide a knowledge platform on blue economy for Pacific Islands. A blue economy is based on clean technologies and renewable energy amongst other things to secure economic and social stability over time.